Taste: Full of all those warm spices that we all know and love, with a hint of apple thanks to the apple cider. Texture: Surprisingly light and fluffy for being a baked doughnut! 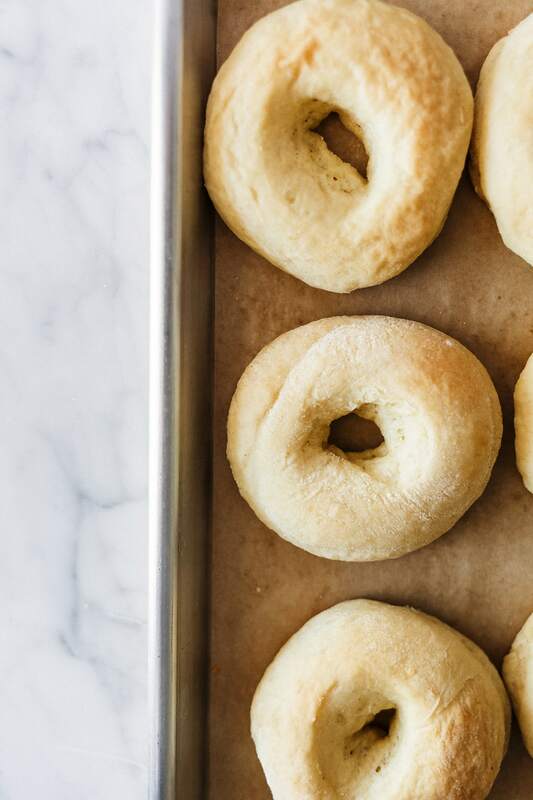 Ease: Perhaps not as easy as some baked doughnuts that use a batter + donut pan, but definitely worth the effort of making the yeast raised dough. Pros: No deep frying mess to clean up! Doughnuts were my family’s go-to special weekend treat. Whether I was having a sleepover and my dad would pick up doughnuts for us to enjoy in the morning, or whether we got dragged to the grocery store and our reward for being good was a doughnut from the bakery case. I think that’s why doughnuts will always have a special place in my heart. But the best kind of doughnuts, the ones that are deep fried and coated in a shiny glaze, are usually time-consuming and messy to make. 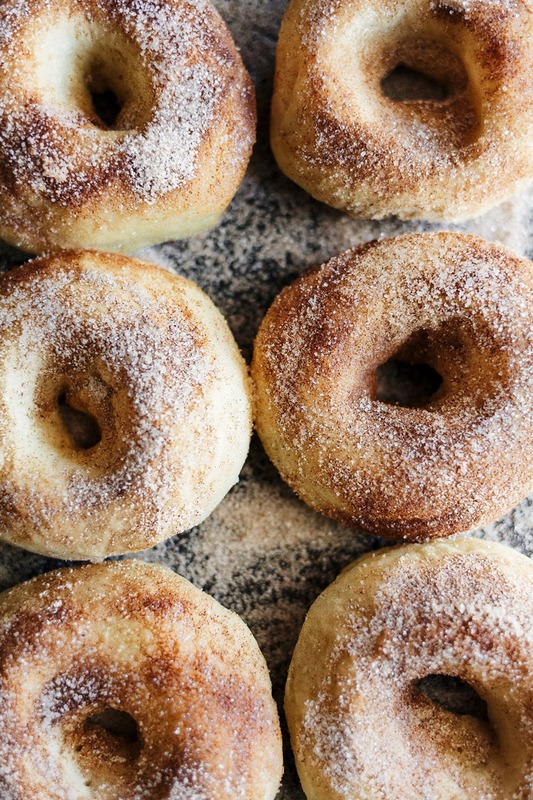 That’s why I’m loving this Baked Apple Pie Doughnuts recipe. It still utilizes a rich yeast-raised dough that creates that soft, light, and fluffy texture we all love in doughnuts. But there’s no giant mess of oil or quite as much guilt from indulging here. You don’t even have to dirty up more dishes to make the glaze. 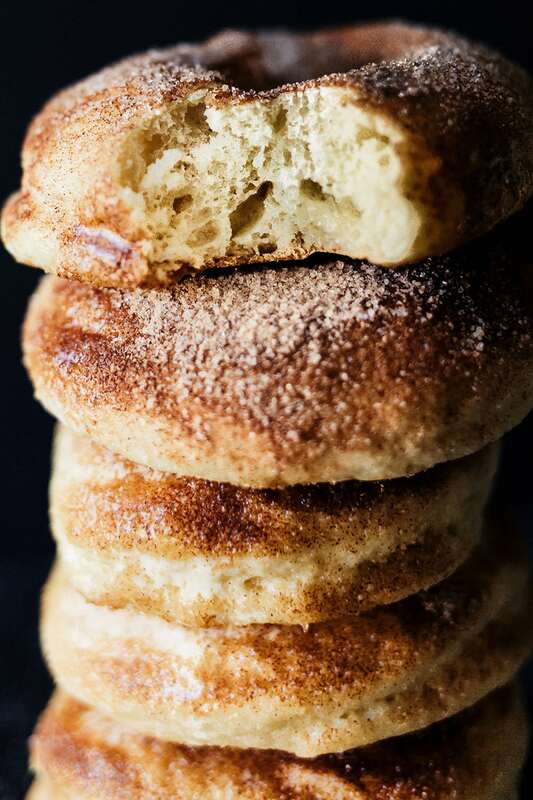 You simply coat the baked doughnuts in a little melted butter then dip in cinnamon sugar. The “apple pie” flavor in this recipe comes from a generous amount of apple pie spices: cinnamon, nutmeg, and allspice. Part of the liquid in the dough is actually apple cider. So the apple taste is relatively mild, but I found this was the best marriage of light and fluffy textures with spiced apple flavors. The dough here is considered a “rich” dough because it has cream and egg yolks added in. This means it can take longer for the dough to knead and will still be quite sticky before its first rise. Not to worry, the dough will lose much of that stickiness as it rises. It’s better to deal with some stickiness than to add too much additional flour and ended up with dense doughnuts. Rich doughs can also take longer to rise, so be sure to give yourself plenty of time! I use instant yeast in this recipe because it’s so simple and easy and doesn’t need to be proofed. If you don’t have instant yeast, feel free to use the same amount of active dry yeast. Simple add it to the warm cider and let it proof for 5 minutes before proceeding with the recipe. The finished doughnuts are best served the day they’re made. The dough can be made and allowed to rise slowly overnight in the fridge if you need to make this recipe ahead of time. If you make and enjoy this recipe, be sure to snap a picture and share it on Instagram, tagging #handletheheat, so we can all see your creations! Heat the apple cider in a small saucepan or in the microwave until warm, about 110°F. In the bowl of an electric mixer fitted with the dough hook, combine the flour, sugar, yeast, and spices. Add the cider and egg yolks and stir until combined. Add the butter and cream and knead for 6 to 8 minutes, or until a smooth sticky dough forms and pulls away from the sides of the bowl. Scrape the dough into a lightly greased bowl. Cover and let rise until doubled in size, about 1 ½ hours. Roll the dough out on a floured surface until it’s just over a ½-inch in thickness. Use a flour dusted doughnut cutter to cut out 6 doughnuts and holes from the dough. 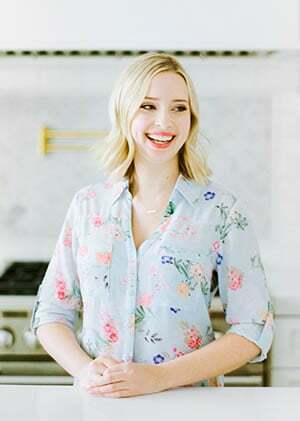 Place on a large baking sheet lined with parchment paper, spacing at least a few inches apart. Allow to rise until puffy, about 30 to 45 minutes. Meanwhile, preheat the oven to 350°F. Bake the doughnuts for about 12 minutes, or until golden and puffed. Let cool slightly before brushing each doughnut with melted butter. In a small bowl, combine the sugar and cinnamon. Sprinkle generously over the buttered doughnuts. Serve warm.